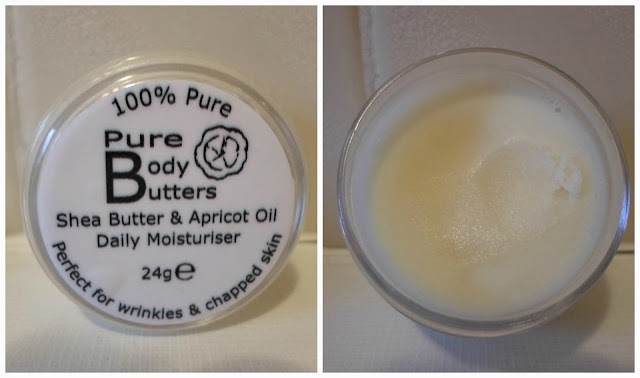 I was sent a pot of Pure Body Butters Shea Butter & Apricot Oil Daily Moisturiser. The Pure Body Butters range is small but perfectly formed, it also includes two cocoa butter based moisturisers and gift set. There are no nasty ingredients; these are 100% natural and cruelty free products. My Vegan readers should select the Cocoa Shea Ultimate Moisturiser as the other two contain beeswax. Purely based on personal preference, I would not use this on my face but it’s perfect for my body. I have been using this on my feet to tackle my dry heels something which I am prone to in the colder weather. There are no essential oils in these products so ideal for those with sensitivities. If you want a simple natural product for dry skin then I am happy to point you in the direction of Pure Body Butters. My only critic is the jar size (24g). At first I thought it was a sample but this is the size advertised on the website. It's a good size for carrying around in pockets and handbags but I am a little confused. I know shea butter goes a long way but body creams are generally packaged in larger jars.